﻿ Scissor Jack,Scissor Jack,Leveling Jack,Mechanical Scissor Jack Manufacturer,Supplier,Factory - Cnjacks Enterprise Co., Ltd.
A scissor jack or stabilizer jack is a powerful lifting jack or leveling jack operated by a screw in horizontal position that lengthens or shortens the horizontal of a parallelogram consisting of the linkage of the jack. 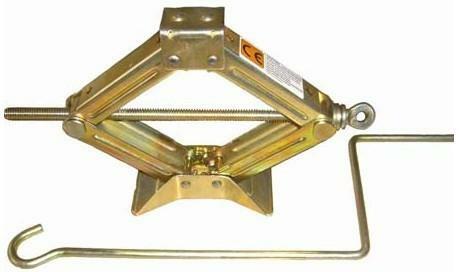 Cnjacks leveling scissor jacks, hydraulic scissor jacks and electric scissor jacks are crafted with heavy duty steel construction for longevity;small compact design for easy strorage ;100% in house tested for reliability and safety; powder coating with zinc plated handle for max. rust protection.In addtion, All scissor arms are engaged by means of gear design to ensure straight vertical extension and retraction. Cnjacks' leveling scissor jack could be easiler to manage than other hydraulic lifts, and sure, they are certainly much easier to use than typical pump action devices such as bottle jacks, floor jacks and hydraulic jacks etc.